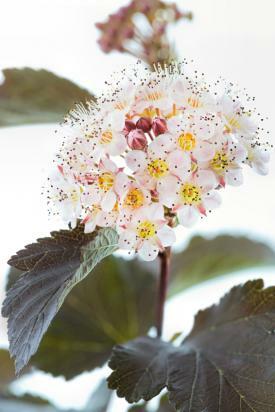 Summer is the season of flowers, especially when it comes to shrubs. There are so many to choose from, it's easy to find the perfect match for any landscaping situation. Explore the options below for ideas on what might fit best in your garden. The name says it all with this one - butterflies flock to its long and conical deep purple flowers, which bloom repeatedly throughout the summer. 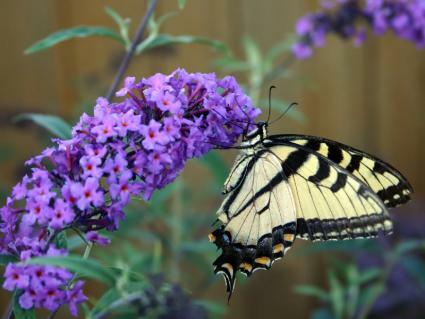 Butterfly bush has an upright form, growing 6 to 10 feet tall and 4 to 6 feet wide; this makes it a good choice for a tight spot or as a vertical focal point in a bed of low-growing perennials. It appreciates full sun, a weekly soaking when the weather is hot, and is quite adaptable to varying soil conditions. Trim off the dead flower heads to encourage repeat blooming and cut the whole shrub back about 30 percent when it goes dormant in fall to keep it growing compact and tidy year after year. Also known as blubeard, these short woody shrubs are dazzling in summer with their sky blue flowers and aromatic foliage. There are several named varieties to choose from, but most grow about 4 or 5 feet tall and wide, typically with a mounding growth habit. 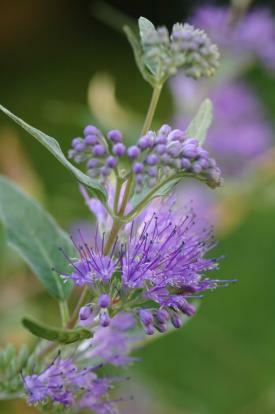 Caryopteris first blooms in August and they last for a month or more. Plant it in full sun or part shade as a midsize component of a mixed border of taller shrubs and smaller perennials. Caryopoteris is tough and resilient in times of drought, but looks its best with regular moisture; cut it back up to 50 percent in fall for a full bloom the following year. 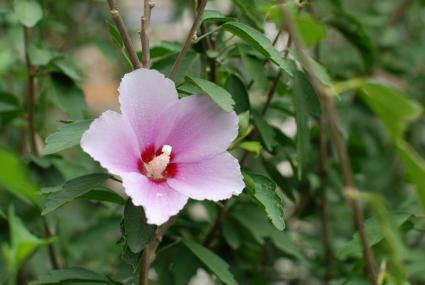 Rose-of-Sharon is a tropical-looking hibiscus plant for temperate climate gardens and summer is its time in the spotlight, when the showy pink blossoms make their appearance. It will bloom repeatedly for the entire summer. This shrub has a strongly upright growth habit, typically reaching 8 feet in height but only 3 or 4 feet wide, with the flowers spread out along its tall vertical branches. Plant Rose-of-Sharon at the back of a flower border where the smaller plants can hide the base of the plant. It flowers most profusely in full sun, though it is actually quite shade tolerant; it grows almost like a weed with little care for the quality of the soil it is planted in or how frequently it is watered. Rose-of-Sharon will tolerate being cut nearly to the ground in winter and in cold climates it will die all the way to the ground only to re-sprout vigorously from the ground each spring. Hailing from the Pacific Northwest, this deciduous shrub is right at home in woodland gardens throughout the country, where it's creamy white flowers light up the understory all summer long. This is a massive shrub growing to 15 feet tall and wide, making it a good choice for large properties with high-canopied trees for it to grow under. It has a woody form with ornate five-pointed leaves and attractive peeling bark in addition to the profuse display of saucer-shaped flowers. Rich soil and regular moisture are about all the plant needs to thrive and it takes on a graceful shape naturally with little or no pruning. Few flowers say summer like the deep aquamarine blooms on a hydrangea bush. Growing to the size of a small child's head, they are particularly electrifying when planted in masses. Blooms appear in August and last for a month or more. 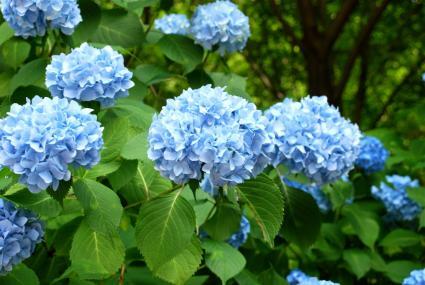 Hydrangea typically grows 4 to 5 feet tall and wide with upright stalks that are crowned in globe-shaped puffy blue flowers. They are an effective foundation planting against a wall of the house, especially in partially shaded areas. Give them plenty of water, rich soil, and above all, if you want blue flowers instead of pink, make sure to amend the soil with peat moss if it is not naturally acidic. Oleander is a tough-as-nails shrub that will grow and flower profusely in hot, dry, rocky places where most other plants would fail. Oleander is evergreen with an upright habit that makes an excellent privacy screen, growing up to 12 feet tall. It has a naturally tidy growth habit and is also amenable to being sheared into a formal hedge, though it does not otherwise require any maintenance. Red-, pink- and white-flowering varieties are available to suit your preferred color scheme, and it blooms repeatedly for the entire summer. 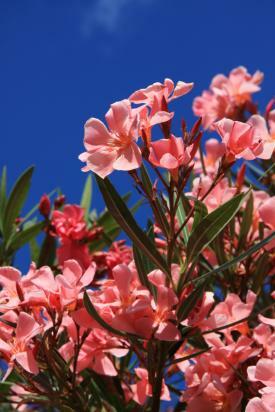 Think twice about planting oleander where pets or children play, as the foliage is highly toxic. Rockroses are not at all related to roses, though the flowers bear a slight resemblance to certain wild rose species. They are quintessential summer plants, thriving in heat that would melt the sidewalk. 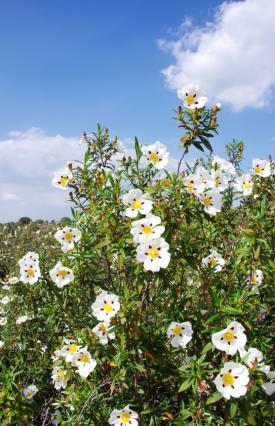 Depending on the variety, rockrose flowers range from whites and yellow to reds, pinks and purples and their form ranges from 1-foot tall prostrate ground covers to 6-foot shrubs. The rockrose blooms repeatedly for the entire summer. They are woody plants with unique foliage that has a crinkled appearance and a high essential oil content that makes the plants glisten in the sun. They perform best in dry, infertile soil and need little in the way of pruning - taking too much care of a rockrose usually does more harm than good. Spirea is an old-fashioned, time-tested garden shrub with elongated plumes of white flowers in mid-summer. This species typically grows to about 6 or 8 feet in height. The branches are upright, long and pendulous, often arching outward from the weight of the flowers. 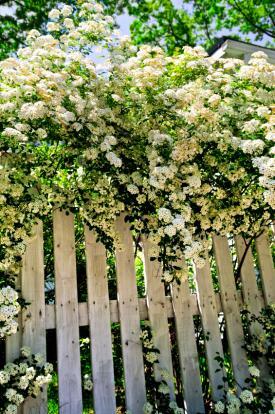 They are a great choice to plant along a picket fence or against the foundation of the house. Spirea needs weekly water and good garden soil to maintain a lush appearance and full flower display. Most roses bloom in summer, but few are as easy-to-grow as the Knock Out varieties. These come in red, pink and various pastel shades and bloom repeatedly from spring through fall. 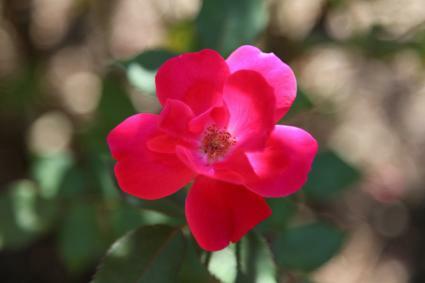 Knock Outs grow in a neat rounded shape to 4 or 5 feet tall and wide with thorny branches and oval-shaped leaves that rarely suffer from the diseases that afflict many other rose varieties. They are excellent as a flowering hedge, looking better when grown in a mass than as a single plant. Though they are tough and hardy, enriching the soil with compost and watering the plants on a weekly basis in summer is necessary to keep them looking their best. Viburnum's blossoms are poofy and ball-shaped a bit like hydrangea, but they are pure white, giving it the alternative name snowball bush. It blooms in early June for a few weeks. Also like hydrangea, they are at home in partial shade. Unlike their colorful counterparts, viburnums have a tall, upright growth habit, typically growing to 6 or 8 feet tall and 4 to 5 feet wide. They are beautiful standing all by themselves, making a worthy focal point, but can also be grouped in a hedgerow or used as a foundation planting. 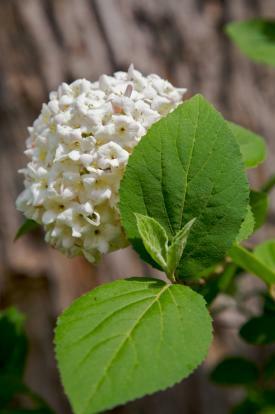 Viburnums like regular water rich, well-drained soil, high in organic matter. Whether you need something for sun, shade, wet or dry conditions, there is a summer flowering shrub that can do the job. In fact, there are so many species to choose from that you can probably find a species for each of these growing environments in every color of the rainbow.